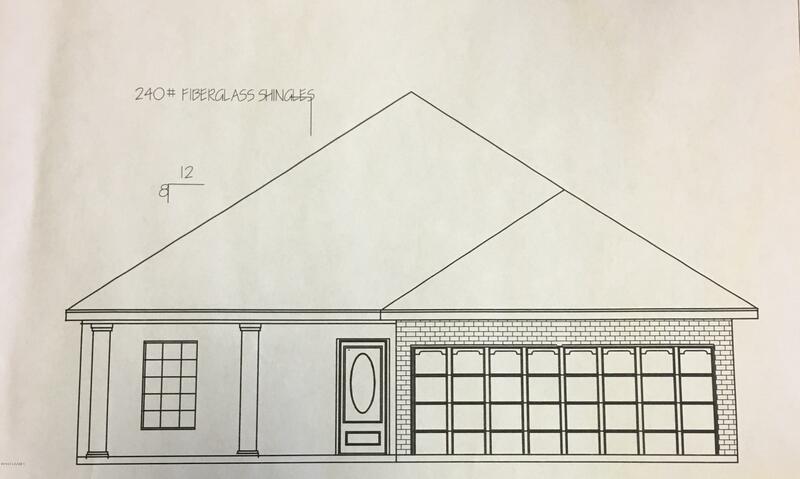 Home will feature 3-bedrooms, 2-full baths and 9-foot ceilings. The large living room will have tray ceiling detail and will be open to the kitchen and dining area. The kitchen will feature slab granite and a timeless cabinet style. The master bedroom will have tray ceiling detail and the master bath will have double sinks, double closets and separate shower and soaking tub. Flooring will be laminate wood in the living areas and ceramic tile in the wet areas. Home will have a 2-car enclosed garage at front and a covered patio off the back.Call today to get details and schedule your appointment to view. Plan and Specs subject to change at builders discretion. Copyright 2019 Realtor® Association of Acadiana' MLS. All rights reserved. The data relating to real estate for sale on this web site comes in part from the IDX Program of the Realtor® Association of Acadiana' MLS, and is updated as of 2019-04-18 15:49:46. Information Deemed Reliable But Not Guaranteed. IDX information is provided exclusively for consumer's personal, non-commercial use and may not be used for any purpose other than to identify prospective properties consumers may be interested in purchasing. Any use of search facilities of data on this site, other than by a consumer looking to purchase real estate, is prohibited.